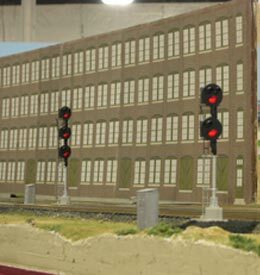 The Pizza Central has 59 Custom Signals on the Layout with 2 four track signal bridges, 2 Bracketed Towers and 6 Cantilever Signal Bridges. I am running the Custom Signal Modular Signal System. I am using the TSC-1 and the BSC-1 boards right now and will incorporate the TDC-1 and BSF-1 boards when available. 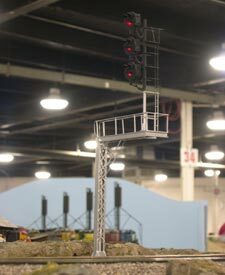 These signals are the best I have seen for O-Gauge with unbelievable details. Support from Terry has been tremendous. I have many special situations on the layout that I could not find in the track configuration library; however, Terry has gone the extra mile in helping me figure out my needs. Although Terry could do all or any part of the installation; I choose to do the installation myself. I found this to be straight forward and fun to do. With 59 Signals I used over 6700 feet of wire. It does take time for the installation, however, the results were well worth the time. 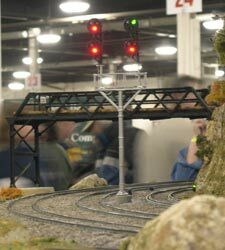 I highly recommend this system for any small or large O-Gauge Layout. The products are the best and the support is ever better. 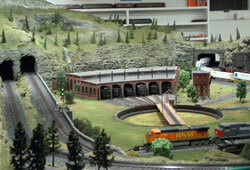 The Southern New England Model Railroad Club is an O Scale model railroad club located in Gardner Massachusetts. 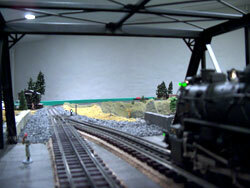 The club currently has eleven members and operates a 21' x 83' Modular layout. 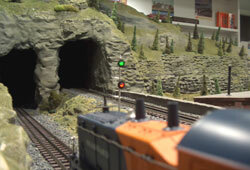 The Southern New England Model Railroad Club was a cosponsor of the 1998 and 2008 National O Scale Conventions. 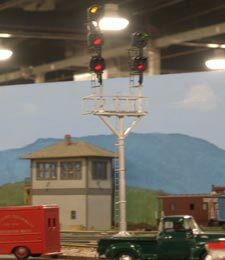 Our layout was on display there and is on display at the Amherst Railway Society Big Train Show in January each year at the Eastern States Exposition grounds in West Springfield Massachusetts. The Double track main lines allow for long trains with prototypical signals at crossovers and yard entrances and exits. 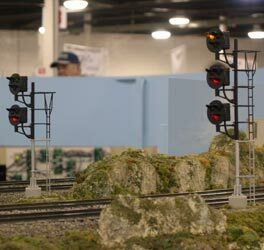 We have 5 Bracketed towers and 1 N&W style cantilever signal bridge along with many OG style ground signals from Custom Signals. 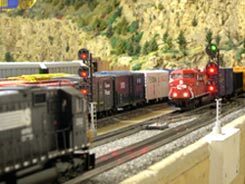 Our Model Railroad is an Hi-Rail model railroad located near Philadelphia Pennsylvania and is a 35' x 12' permanent layout in the shape of an "L". 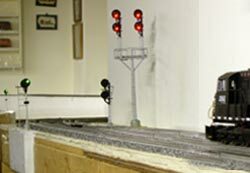 We try to keep everything to scale using Ross Switches; Gargrave Track and O Scale freight and passenger cars. The single track main line traverses the layout on two levels and allows for multi-engine lash-ups with lots of freight or passengers cars. 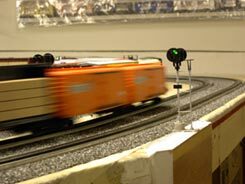 We have a scissors crossover from Ross so that our trains can traverse the layout three times without riding the same track without dispatcher intervention. 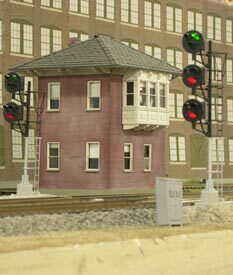 I had envisioned implementing our signal system quite some time ago (several years ago in fact) and purchased a few custom handmade NYC Style Bracketed Towers, and several masted NYC & OG Style signals from Custom Signals at that time. 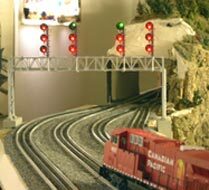 Recently the layout has been completed and now it is time to complete the final decoration with the signals that I already have and the newly purchased OG Style signal which you can see in the photo below. 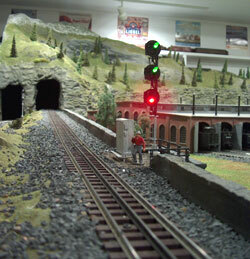 The photos in the first row (above) show our new OG style signal protecting main line track (up grade) hidden inside the mountain and the custom handmade NYC style signals mounted on a Bracketed Tower installed just before the switches for the passing and freight sidings (not shown) at the tunnel exit near the mountain top. The location is not quite prototypical, because, I have limited space at the tunnel exit. While the Bracketed Tower is completely installed; it is not wired-up just yet (new photos coming soon). 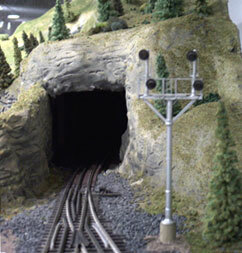 The left photo in the second row (above) shows another custom handmade masted NYC style signal protecting the main line track (down grade) going into the mountain and the long hidden track that is beyond the lower tunnel. The photo on the right gives you a bird's eye view of the mountain and the two track portals (down and up grade). I've always liked working on electronics and layout wiring from my high school days a long time ago. So this was fun working thru the signal installation process and using the TCL. The TCL (Track Configuration Library) has switch layout and circuit board diagrams for most any track design. 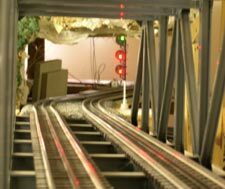 The prototypical operations of the signals are terrific and we actually use them to prevent crashes in the tunnels. 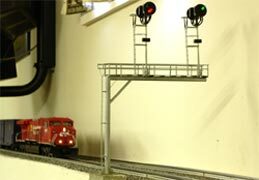 I highly recommend this system for any small or large O-Gauge Layout. The support is great too!